As an administrator, you can configure who can create documents at the document class level. By default, all members of the contributor role can create new documents in your library. To change this setting, you can define a specific list of document creators in the document class security settings. 4. 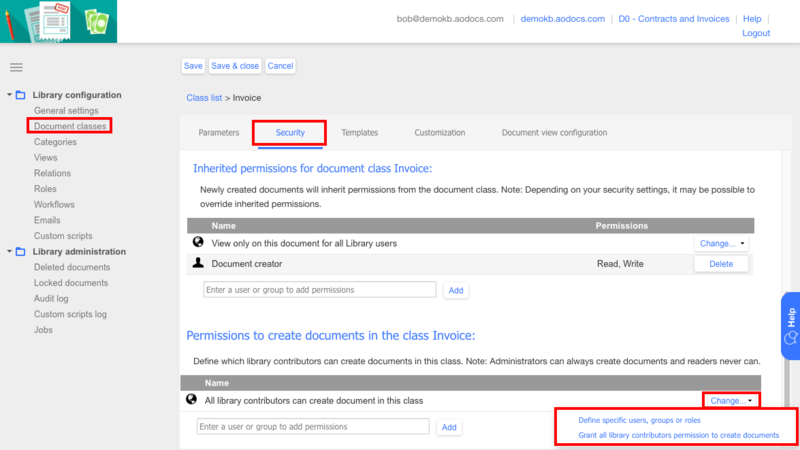 In the Security tab, under Permissions to create documents in the class [class name], press Change. Grant all library contributors permission to create documents (default option): all library contributors can create documents in this class. Define specific users, groups or roles: only the users and groups listed in the table can create documents in this class. Note: The users, groups and roles must be contributors. Note: You can't add users defined as readers at the library level as document creators.